Embedded systems face security challenges unlike those in the IT realm. To meet those needs, microcontroller vendors continue to add ever-more sophisticated security features to their devices—both on their own and via partnerships with security specialists. For embedded systems, there is no one piece of technology that can take on all the security responsibilities of a system on their own. Indeed, everything from application software to firmware to data storage has a role to play in security. That said, microcontollers have been trending toward assuming a central role in embedded security. One driving factor for this is the Internet-of-Things (IoT). As the IoT era moves into full gear, all kinds of devices are getting more connected. And because MCUs are a key component in those connected systems, MCUs have evolved in recent years to include more robust security features on chip. That trend has continued over the last 12 months, with the leading MCU vendors ramping up those embedded security capabilities in a variety of ways—some on their own and some by teaming up with hardware and software security specialists. 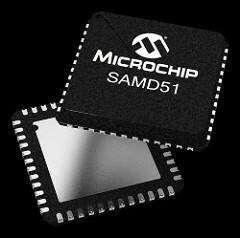 Exemplifying these trends, Microchip Technology in June released its SAM L10 and SAM L11 MCU families (Figure 1). The devices were designed to address the increasing risks of exposing intellectual property (IP) and sensitive information in IoT-based embedded systems. The MCU families are based on the Arm Cortex-M23 core, with the SAM L11 featuring Arm TrustZone for Armv8-M, a programmable environment that provides hardware isolation between certified libraries, IP and application code. Security features on the MCUs include tamper resistance, secure boot and secure key storage. These, combined with TrustZone technology, protect applications from both remote and physical attacks. The SAM L10 and SAM L11 MCU families provide TrustZone for Armv8-M hardware isolation between certified libraries, IP and application code. The MCUs also feature tamper resistance, secure boot and secure key storage. In addition to TrustZone technology, the SAM L11 security features include an on-board cryptographic module supporting Advanced Encryption Standard (AES), Galois Counter Mode (GCM) and Secure Hash Algorithm (SHA). The secure boot and secure key storage with tamper detection capabilities establish a hardware root of trust. It also offers a secure bootloader for secure firmware upgrades. Microchip has partnered with Trustonic, a member of Microchip’s Security Design Partner Program, to offer a comprehensive security solution framework that simplifies implementation of security and enables customers to introduce end products faster. 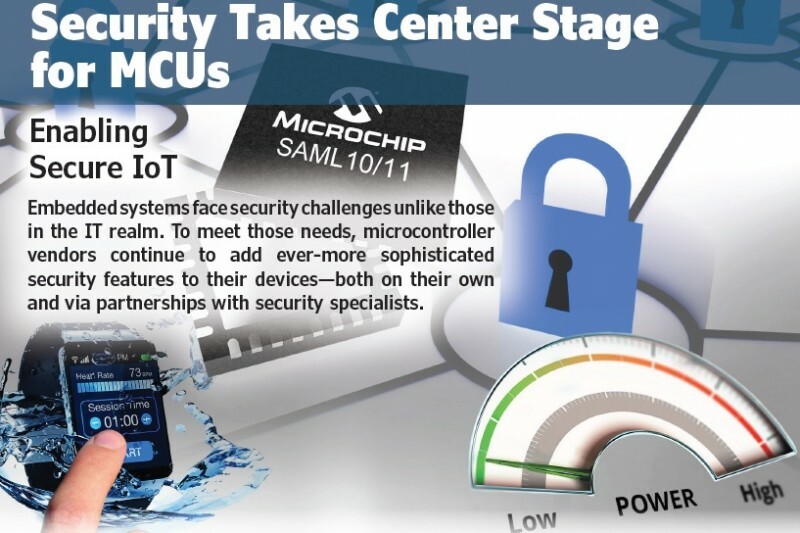 Microchip has also partnered with Secure Thingz and Data I/O Corporation to offer secure provisioning services for SAM L11 customers that have a proven security framework. Likewise focusing on IoT security, NXP Semiconductor in February announced its K32W0x wireless MCU platform. According to NXP, it’s the first single-chip device with a dual-core architecture and embedded multi-protocol radio. 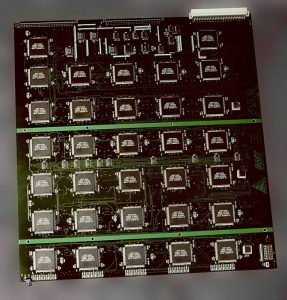 It provides a solution for miniaturizing sophisticated applications that typically require a larger, more costly two-chip solution. Examples include consumer devices such as wearables, smart door locks, thermostats and other smart home devices. The K32W0x embeds a dual-core architecture comprised of an Arm Cortex-M4 core for high performance application processing and a Cortex-M0+ core for low-power connectivity and sensor processing. Memory on chip includes 1.25 MB of flash and 384 KB of SRAM. Its multi-protocol radio supports Bluetooth 5 and IEEE 802.15.4 including the Thread IP-based mesh networking stack and the Zigbee 3.0 mesh networking stack. Security features of the K32W0x MCU include a cryptographic sub-system that has a dedicated core, dedicated instruction and data memory for encryption, signing and hashing algorithms including AES, DES, SHA, RSA and ECC. Features of the K32W0x’s security system include a cryptographic sub-system that has a dedicated core, dedicated instruction and data memory for encryption, signing and hashing algorithms including AES, DES, SHA, RSA and ECC. Secure key management is provided for storing and protecting sensitive security keys (Figure 2). Support is enabled for erasing the cryptographic sub-system memory, including security keys, upon sensing a security breach or physical tamper event. The device has a Resource Domain Controller for access control, system memory protection and peripheral isolation. Built-in secure boot and secure over-the-air programming is supported to assure only authorized and authenticated code runs in the device. To extend the on-chip security features of the K32W0x MCU platform, NXP has collaborated with B-Secur, an expert in biometric authentication, to develop a system that uses an individual’s unique heart pattern (electrocardiogram/ECG) to validate identity, making systems more secure than using an individual’s fingerprint or voice. 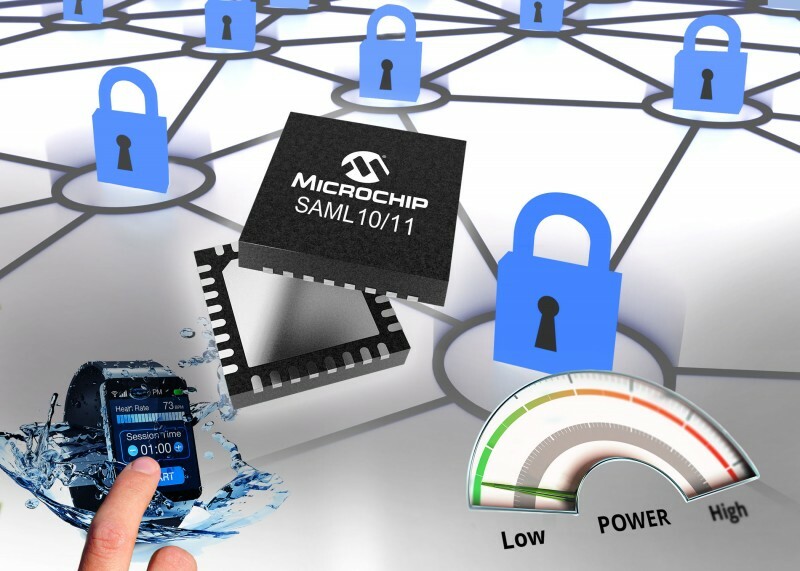 Microchip has announced its SAM L10 and SAM L11 MCU families addressing the growing need for security in IoT applications. The new MCU families are based on the Arm Cortex-M23 core, with the SAM L11 featuring Arm TrustZone for Armv8-M, a programmable environment that provides hardware isolation between certified libraries, IP and application code. Security features on the MCUs include tamper resistance, secure boot and secure key storage. These, combined with TrustZone technology, protect applications from both remote and physical attacks. In addition to TrustZone technology, the SAM L11 security features include an on-board cryptographic module supporting Advanced Encryption Standard (AES), Galois Counter Mode (GCM) and Secure Hash Algorithm (SHA). The secure boot and secure key storage with tamper detection capabilities establish a hardware root of trust. It also offers secure bootloader for secure firmware upgrades. The SAM L10 and SAM L11 Xplained Pro Evaluation Kits are available to kick-start development. All SAM L10/L11 MCUs are supported by the Atmel Studio 7 Integrated Development Environment (IDE), IAR Embedded Workbench, Arm Keil MDK as well as Atmel START, a free online tool to configure peripherals and software that accelerates development. START also supports TrustZone technology to configure and deploy secure applications. A power debugger and data analyzer tool are available to monitor and analyze power consumption in real time and fine tune the consumption numbers on the fly to meet application needs. Microchip’s QTouch Modular Library, 2D Touch Surface Library and QTouch Configurator are also available to simplify touch development. 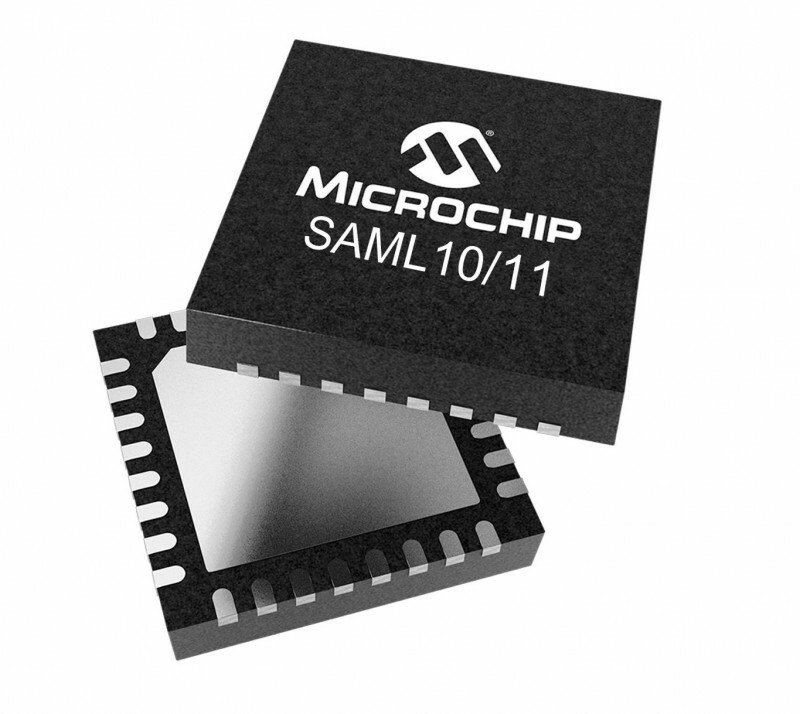 Devices in the SAM L10 series are available starting at $1.09 (10,000s). Devices in the SAM L11 series are available starting at $1.22 (10,000s). How do you verify the security of microcontrollers? MCU manufacturers often make big claims, but sometimes it is in your best interest to verify them yourself. 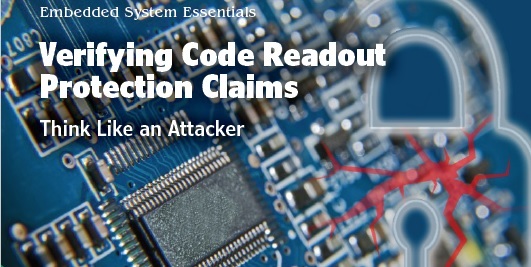 In this article, Colin discusses a few threats against code readout and looks at verifying some of those claimed levels. You’ve got your latest and greatest IoT toaster designed, and you’re looking to move forward with production. But one thing concerns you: How do you know this stellar code isn’t going to be cloned as soon as you release it to the market? 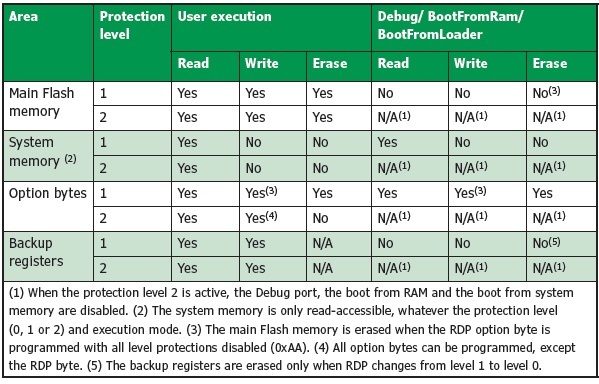 You turn to the firmware protection features of your chosen microcontroller, but how good is it? This article can’t hope to answer that question in general, rather it will instead give you a short example of how to help answer that question for any specific microcontroller. In particular, it will teach you to “think like an attacker” when reading through datasheets. Look for small loopholes that could have big consequences, and you will have a much better time navigating the landscape of potential attacks. One of the most important things is to keep an eye out for new and interesting attacks against these devices. In my January 2018 article (Circuit Cellar 330) I described how there is a published attack against some of the NXP LPC devices, which makes it very easy to unlock them. You can see the presentation entitled “Breaking Code Read Protection on the NXP LPC-family Microcontrollers” by Chris Gerlinsky which describes this attack. Another recent one is an attack against STMicroelectronics’ STM32F0 devices entitled “Shedding Too Much Light on a Microcontroller’s Firmware Protection” by Johannes Obermaier and Stefan Tatschner. That one is a little more limited, but still has some interesting information regarding potential security attacks. I’m hoping to distill some of these attacks down into common problems, which will help you close a few loopholes before someone rips off your IoT toaster design. At least now if it fails in the marketplace you have no one to blame but yourself. To give you something concrete to read (and for me to reference), I’ve chosen to use the ST STM32F303 series because it’s a device I’ve been using myself lately. I’m not going to be revealing any unknown vulnerabilities—so if you’re reading this from your office at STMicroelectronics, no need to sweat. It also has some pretty common configuration options, so makes for a nice reference you can apply to a range of other devices. The first step when you are looking at a new device should be to very carefully inspect the security or debug lock protection portion of the datasheet. They will typically go into a fair amount of detail around how the protection mechanism works. The STM32F3 Reference Manual (RM0316) has this split into two sections. Section 5, entitled “Option byte description” provides information about how the flags are stored in flash. Section 4.3 entitled “Memory Protection” details how this is actually used to protect the code in your device. This excerpt from the datasheet shows how the flash memory read protection levels are defined for the STM32F3 device. Table 2. 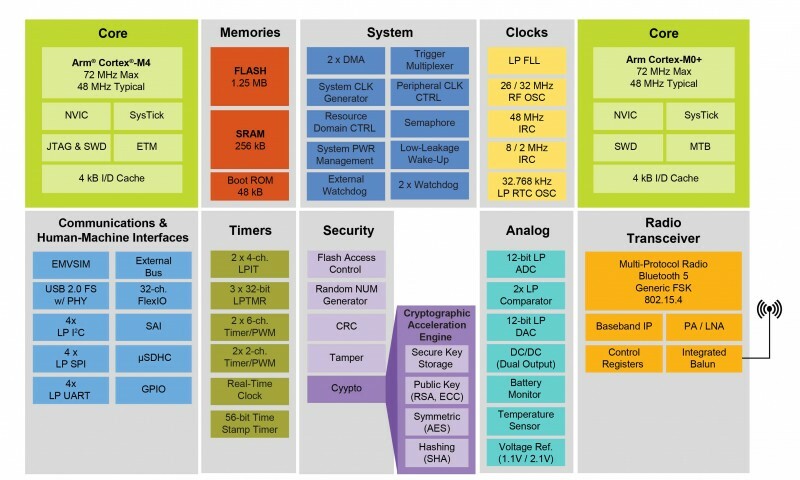 They are the flash memory protection levels, and the associated access allowed at each level. The RDP byte is a special “option byte”, which is the value of a specific location in flash memory. Note the scheme they have chosen uses two bytes, where one is always programmed to be the complement of the other byte. This is presumably used for error checking, and if a byte is not matched with a complement, an error flag is set. Code protection levels 1 and 2 have differing protection abilities. This excerpt from the datasheet shows where flash memory can be read/written/executed from. Right away you should notice that this scheme does not fall victim to the same problem as the LPC attack I talked about before. In particular the LPC attack exploited the fact a fault or glitch could corrupt the flag value, which caused the CPU to disable the protection. With the STM32F303, these invalid levels will all map to Protection Level 1. This protection level does not allow external flash access, which “should” be a good sign. The highest protection level also claims to be impossible to remove, but if we could corrupt the value of the option bytes in memory we could downgrade from Protection Level 2 to Protection Level 1. In fact, this “downgrade” is exactly what was presented by Obermaier & Tatschner. The downgrade used a chip decapsulation and light to flip the bits, which is relatively invasive. Other fault attacks (such as voltage or EM) might work but would require investigation before assuming that. Such temporary fault attacks would require the value is read and latched.